I always ignored URL shortening services in the past; what was the point? My e-mail systems always seemed to handle URLs automatically, forums that I frequented usually shortened the URLs for me and more often than not if I needed a URL in a blog post I created a hyperlink. It wasn’t until I started using Twitter quite a bit that I started to appreciate a really small URL. When you have 140 characters to express your thoughts and you are as verbose as I am, every single character counts. Not long ago I noticed a buddy using Bit.ly to shorten his URLs. Up until then I always thought of TinyURL.com but 5 fewer characters in the domain name alone is substantial so I thought I’d give it a try. I give it my long URL, it gives me back a short URL and then I send that out to people. End of story, right? The reason I really like Bit.ly though is that it has dynamically updated click-through stats. Since I have no control over traffic I link up through Twitter and other services I can see how many people have clicked on a link I have provided. I can also see which conversations have referenced it, something that’s handy if you want to see how people are forwarding around something. 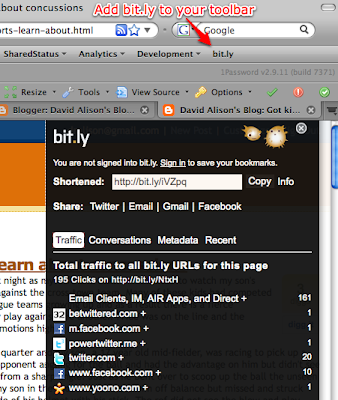 If you happen to hit a URL that has already been “bit.ly’d” then you’ll see the click through stats on it as well. Needless to say services like Bit.ly are taking URL shortening to a completely different level. Got a URL shortening service you really like? Drop a note in the comments and share! And if you’re not already doing it feel free to follow me on Twitter through DAlison.